Water Kefir, what is it, how do you make it, and why is it good for you? We talk about this probiotic powerhouse plus you can enter to win a whole pile of prizes!! Water Kefir, you may have heard about this probiotic drink or it's cousin Kombucha. But did you know how easy it is to make? 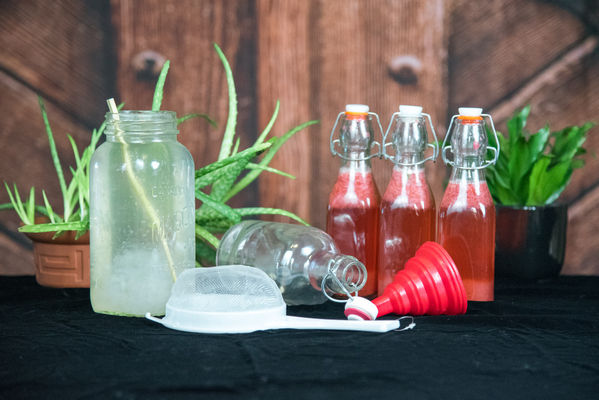 In just a couple of days, you could make your own flavored water kefir. First off, let us establish I do not pronounce kefir correctly. Like most other North Americans I say KEE-fur or KEFF-er. The correct pronunciation is kuh-FEAR. But however you say it- it's delicious! Kuh-FEAR… I am now sitting here talking to myself, please tell me I'm not the only one. Before we get started on this powerhouse elixer I want to tell you about our giveaway. You may not know this, but we LOVE giving stuff away. We have teamed up with some of our fave companies and products to give you a prize bundle valued at over $350 USD. To celebrate you being part of our fantastic tribe, club, matrix or cult, whatever group you most identify with. 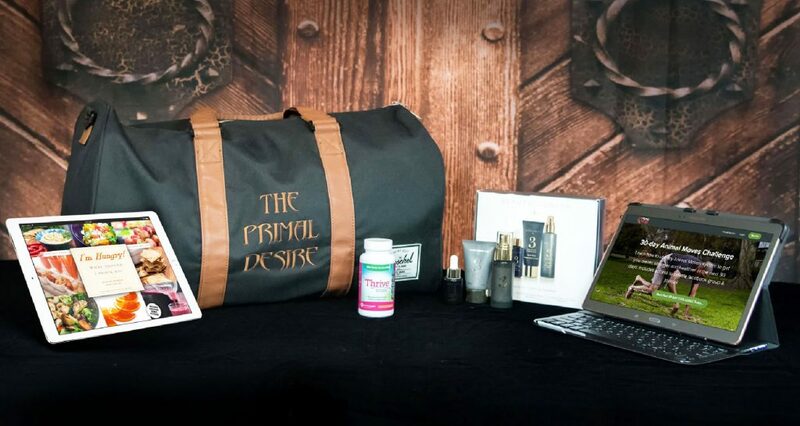 I'd never dream of telling you what to do, but make sure you scroll down and enter to win! Now, what is this effervescent magical beverage?? What makes those tiny bubbles? Fairy flatulence? Unicorn tears? None of these. Water kefir grains make up cultures consisting of various strains of healthy bacteria and yeast, held together in a polysaccharide matrix created by the bacteria. Polysaccharide matrix sounds super cool. Like those bacteria are creating an alternate plane of existence, and I suppose they are. Did you know that your microbiome, yes you, reading this, the DNA of the bacteria in and on your body outnumbers yours at a conservatively estimated 10:1 ratio? SO cool, but I get sidetracked. Water kefir grains are technically called Tibicos, but like secret agents, they have many aliases. Tibi, water kefir grains, sugar kefir grains, Japanese water crystals and California bees, and in older literature as bébées, African bees, Australian bees, ginger bees, vinegar bees, bees, Japanese beer seeds, beer seeds (I love this one), beer plant, ale nuts (haha, Wikipedia said “nuts”), Jack's Magic Beans, eternity grains, and balm of Gilead. Just like humans, every water kefir grain is a unique snowflake, no two are identical! How cool is that? The culture turns sugar, water, and minerals into carbonated probiotic goodness. The process of converting fuel (sugar) into energy creates a byproduct (carbonation) and also alcohol. All ferments create some alcohol and water kefir is in the 0.5-0.75% depending on how long it is cultured. This is less than the alcohol you find in overripe fruit, (0.9-1%)! Drunk on peaches anyone? Like just about every other organism on the planet, when things are going well, you procreate!!! It doesn't take long to have more water kefir grains than you know what to do with! As those grains get it on and multiply, share the love and thin the heard, you can be the probiotic hook up for your friends and family. A fermentation supply specialist, a water kefir pimp! If you don't want to share you can throw those extra grains into a smoothie for a supercharged probiotic kick. If you choose to grow your own, they can't be grown from scratch, but they can grow from ideal conditions and a few training grains. Water kefir grains are an entirely different strain than milk kefir grains and are not interchangeable. But I did discover that you can use water kefir to ferment coconut milk, so look forward to those experimentations! 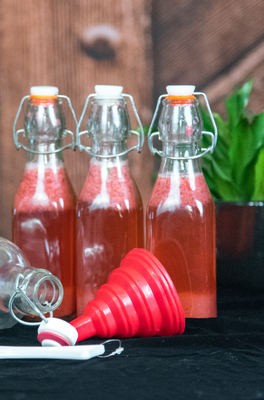 Can You Make Water Kefir Without Sugar? People ask about fermenting water kefir without sugar. You can but you still need some form of sugar. You can use un-sulfured dried fruit (sulfites are preservative that inhibits bacteria growth), or coconut water. I read that the grains cultured in coconut water will not be as strong, and you are less likely to get the reproduction. It is recommended that you alternate culturing your grains in coconut water with sugar water to keep them robust. If you are concerned with sugar content, let your grains sit longer and those bacteria will convert sugars into tiny bubbles, and booze. You'll need some tools to get you started. Try to find a local hook up for grains, but if you can't or maybe simply don't want to, you can order them from Amazon, and then you won't have to put on pants. No pants is always a win for me. I like to find a deal, so hit up garage sales, second-hand stores, or granny's basement to find yourself a glass jar (quart size or larger). If you can't find one, or you need a whole bunch, again, Amazon and we have already covered the no pants perk. You need a nylon strainer, and this doubles as a jar cover. I love kitchen gadgets that do double duty. What is in your water? It's important you have a filter that removes chlorine, this one does more than that! (We are slightly obsessed with our Clearly Filtered water pitcher) Taking out hormones that you don't need, and radiological substances that you definitely don't need. Check out Clearly Filtered water jugs. See if you can dig thru your drawer and find a chopstick, you'll need it, but if you haven't ordered take out in a while, good for you, get this super cool wooden spoon for stirring. Sometimes getting liquid into the bottle can be challenging and messy, I use this silicone funnel, and it makes it slightly less messy. There are a couple different options for swing type bottles, whether you are a “take it and go” type (single serving), or a drink at home with family type (bigger bottles). Just make sure they aren't decorative bottles, or they might shatter, leaving you with a huge mess! Do you have fermenting fever? You should check out some of our more cultured posts! (BAHAHA) Honey garlic, coconut milk yogurt, probiotic primal blue cheese dip. and use the search features for others! 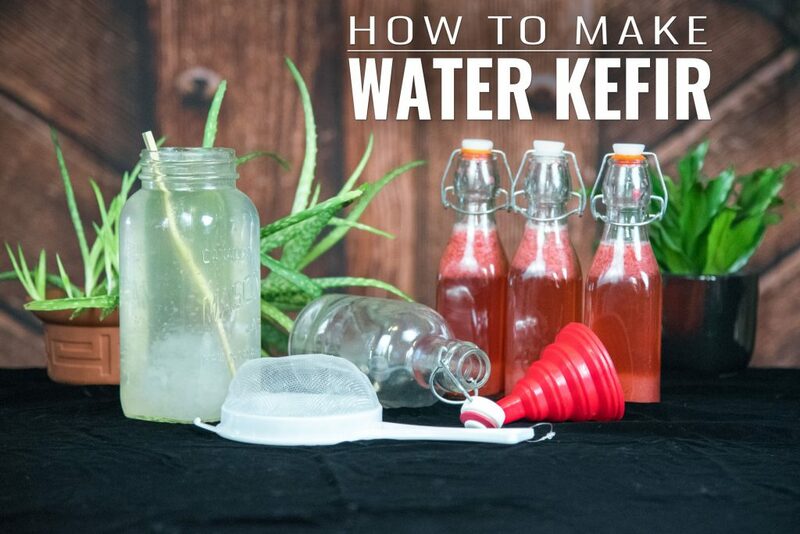 Let us know if you have made water kefir! What are your most interesting combinations? Have you made it without sugar? Catch us on social media, show us your ferment! Connect with us on Instagram or Facebook! 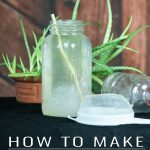 These How-To instructions will give you the basis for making your own fermented water kefir, and the freedom to create your own flavors in the future. Place water kefir grains in a glass jar, add sugar (or dried fruit) and water, and using the spoon or chopstick stir until sugar has dissolved. You can add a pinch of sea salt here if you need more minerals in your water. Place mesh strainer over top of the jar and place in a warm spot. You could alternately use cheesecloth, but make sure the kefir can breathe. 24-48 hours depending on how sweet and how carbonated you want your beverage (less sweet and more carbonated the longer you go). Strain the liquid off the grains and set aside. Prepare a new sugar water mixture to keep the grains alive (and for your next batch). Add 1/4 cup of fruit or juice to the strained off the liquid, and give it a stir (and/or herbs and/or …). Pour into swing top bottles, filling 3/4 full leaving space in the bottle, and seal them up. Leave on a counter 12-24 hours- this is the second ferment. Make sure to “burp” your ferments daily, and then pop into the fridge. Share your adventurous combinations with us! 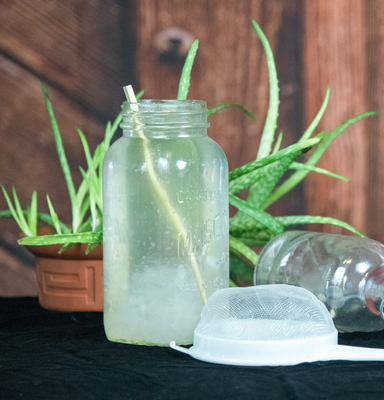 Burping your water kefir is important (watch the video to learn why).